A new organisation to charge Northamptonshire residents for the county council’s colossal debt could be created if the two new unitaries are set up. The idea is being suggested in the unitary proposal which has been put together by all eight Northamptonshire councils and will be voted on in a series of meetings next week. Northamptonshire has a huge debt upwards of £600m made up of a number of historic loan agreements such as Public Works Board loans and PFI agreements which have paid for the likes of roads and schools. It has a number of higher interest LOBO loans in its portfolio equalling more than £100m. 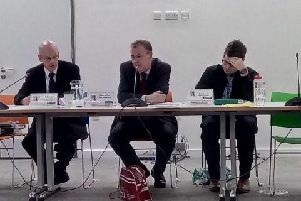 The county’s financial collapse led to then Secretary of State Savid Javid suggesting the council be abolished and a unitary system introduced which would replace all borough and district councils as well. The debt of the county authority has been a key concern of councillors and residents but it is looking unlikely that it will be reduced or wiped out by central government and will be a liability for residents over the next decades. The bid proposal makes the suggestion about a body to charge a precept. However, the details of this precept suggestion are not fleshed out in the 90-page PricewaterhouseCoopers report commissioned by all eight councils. All councils will consider the same proposal next week and councillors will exercise their right to have a say on the plans which could lead to the biggest shake-up in local governance in Northants in 40 years. Even if only one of the councils has a majority vote in favour of the bid it can be submitted to the Secretary of State James Brokenshire. He can then start the wheels in motion for bringing in the new unitaries, which will include the suspension of next year’s planned borough and parish elections and the creation of two new shadow unitaries. Unitaries are timetabled to be in place for May 2020.